I still can’t help but marvel at this moment in our lives. Sure, I expected things to be different. Less sleep, less time, less money… it’s funny how often our depictions of parenthood focus on the sacrifice. Or maybe, when we consider starting or growing our family, we just hone in on the sacrifice in the presence of our own fear. But it’s so much more than that. I know now that parenthood is truly impossible to explain… that without having the experience, one really can’t know the feeling. Even after years of watching Mark with Austin, with the evidence right there in front of my eyes, I still had no idea how important this little person would be to me until he arrived. Confronted this new, beautiful normal, I’ve already begun to break my own rules… Arlo spent his first four weeks in our bed. A move I never thought I’d be comfortable with for more reasons than one. But after so many months together, it just didn’t feel right to part from him so quickly… he was so tiny and fragile and, though it wasn’t logical at all, I felt more capable of protecting him if he stayed in my arms. So he did, day and night, until I finally managed to wean myself and move him, slowly, to his bassinet. I know I’ll give in on more than I ever thought I would, but I don’t mind a bit. Some essential values will always remain… like a desire to instill a love of healthy, whole food in my children. 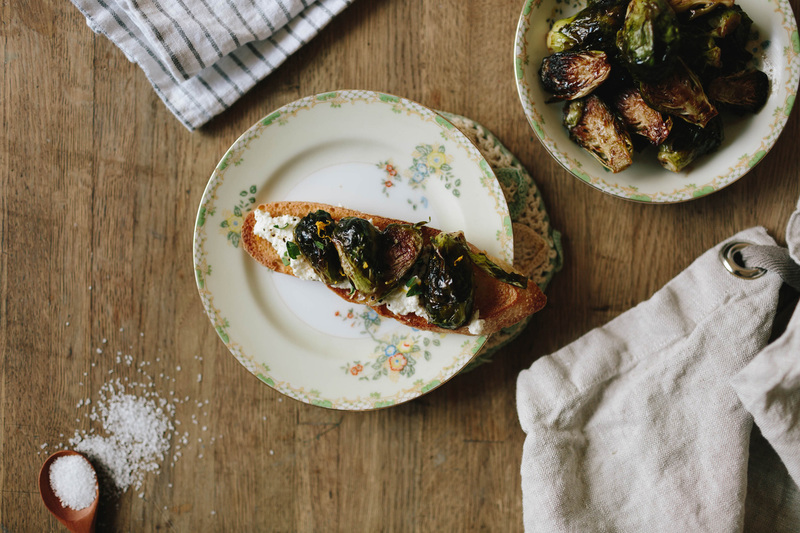 Brussels sprouts might get a bad wrap, but they’re one of my absolute favorite foods… roasted, shaved, raw or cooked, I love them all… and lately we’ve been working them into practically everything we eat. I’m proud that Austin digs them just as much as we do, and I hope that this newfound softy inside me doesn’t suddenly decide to give Arlo a pass. Of course, I know it won’t… I want him to truly experience all that life has to offer, and a big part of that — as far as his father and I are concerned — is good food. Without fish, or spice, or green, delicious brussels sprouts, the world would be a little less full. And I look forward to introducing him to all of our favorites… even if (and when) he spits them out. P.S. 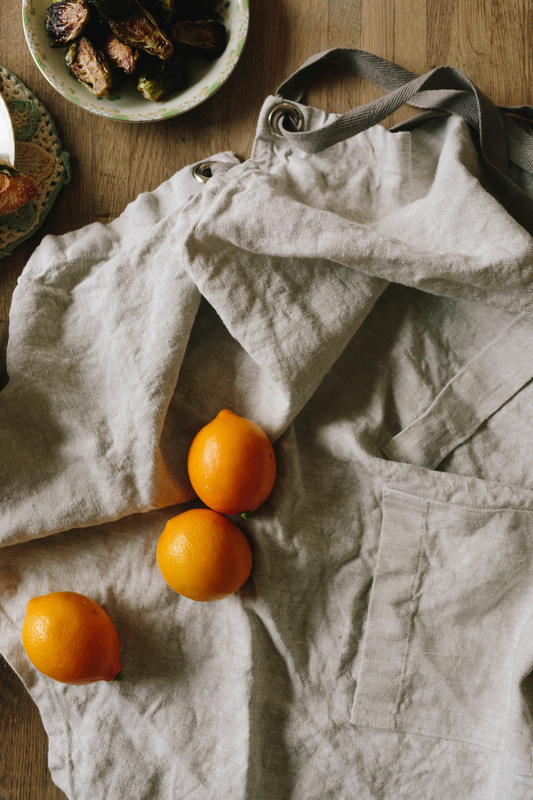 Are those the most ridiculously beautiful Meyer lemons you’ve ever seen? They look like tangerines. 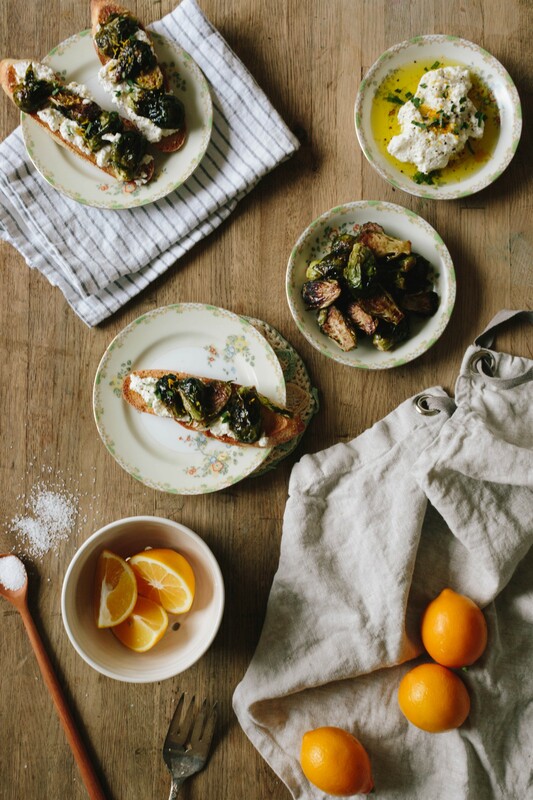 Clean and halve brussels sprouts from top to bottom. In a bowl, toss the sprouts, olive oil, worcestershire sauce, salt, and pepper. On a lined baking sheet, place the coated brussels sprouts cut-side down. Bake for 10-15 minutes, then flip and continue baking for another 10 minutes or until soft. 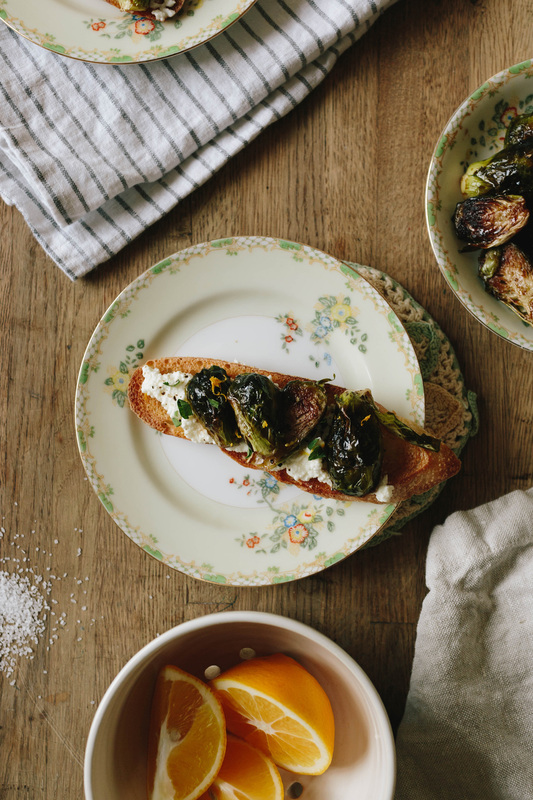 While brussels sprouts are baking, cut a good quality baguette into slices, spread with butter, and toast under the broiler. When the brussels sprouts have finished baking, toss in a bowl with juice of Meyer lemon and balsamic glaze. 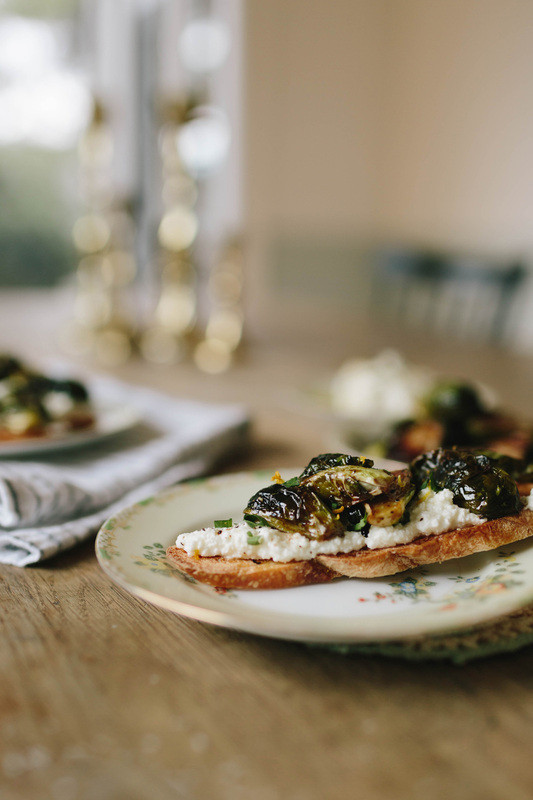 To serve, smear ricotta on the toasted baguette and drizzle with a little olive oil. Top with the roasted brussels sprouts and finish with freshly grated Meyer lemon zest, chopped tarragon, and salt and pepper. © 2019 Holson House. All rights reserved.